Cyclists can now call AAA and other groups for help when they run into trouble during a ride. 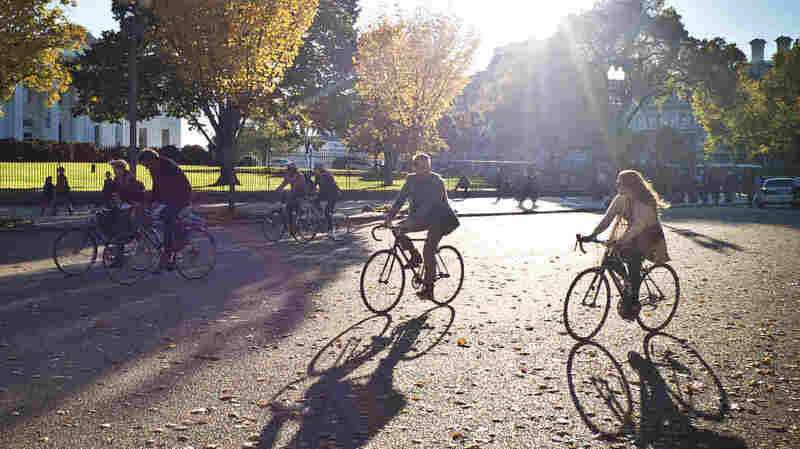 Here, cyclists ride near the White House in Washington, D.C., last autumn. It's not going to change its name anytime soon, but auto membership club AAA is increasingly in the business of fixing bikes and giving rides to cyclists who run into trouble. AAA clubs in Colorado and Southern New England announced the new service in time for this week's Bike to Work Day, following the lead of other regional auto clubs. The organization, whose territory includes Connecticut, Massachusetts, New Jersey and Rhode Island, will send mechanics in trucks that are outfitted with bike racks to cyclists who call for help, in a new benefit the company says comes with existing memberships. "Whether for sport, transportation or family fun, the number of people riding bicycles is on the rise. So in line with our goal to help keep our members moving, it made sense to extend our roadside assistance to include bicycles. It's a natural." The car club isn't the only one to offer cyclists help — as The Riding Reporter notes, similar services from Spoke Bicycle Insurance and Better World Club are available in some areas. The AAA plan, which covers both its members and their teenage children who might not yet have a driver's license, is part of a growing trend within AAA. The organization's Washington state club began its bike program in 2012. AAA Colorado followed suit this month; the program is also offered in bike-friendly Minneapolis. "Service for bike riders has been available in Oregon and Idaho since 2012 and in New Jersey since last year. In Massachusetts, about 30 AAA trucks will be outfitted with bike racks." The trucks can't get to isolated bike paths, meaning cyclists will have to make their way to a road to receive help. Once they're picked up, they can ride for up to 10 miles without an extra fee. "The bicycle service, provided at no additional cost, operates much like roadside assistance," AAA's Horizons magazine says. "Each member receives two bicycle calls per year, neither of which count against annual road service allotments."